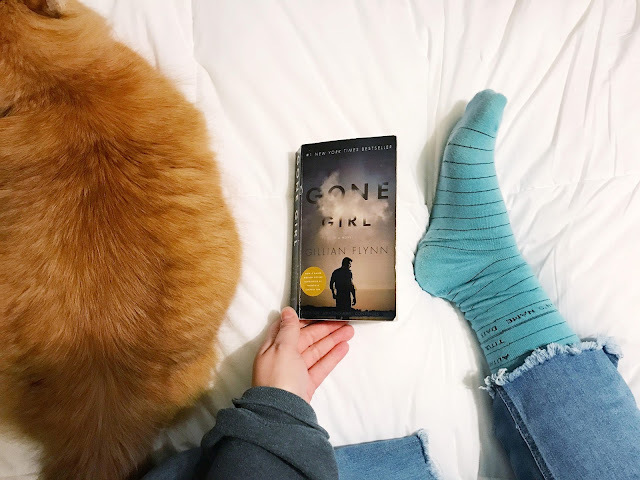 POPSUGAR Reading Challenge Prompt: A book made into a movie you've already seen. Brief synopsis: When Nick's wife, Amy, goes missing in a perceived struggle on their five-year anniversary, an investigation commences. As Nick's lies start to unravel, all signs start to point to him. Simultaneously, the reader gets snippets from Amy's journal that gives more in-depth glances into their relationship. And oh, did I mention Amy's kind of famous because of a series of children's books based off her life. So, this story is national news. Maybe this wasn't the best book to read to fulfill this prompt. Gone Girl has a pretty impressive twist - one that's revealed only halfway through the book. So, I already knew what going to happen, and I already hated all of the characters: Amy, Andie, Nick... in that order. I did feel the book was well-written though. It's the second book I've read from Gillian Flynn, and I quite like her writing style. I've honestly seen a good bit of negative reviews for the book, which surprised me. I think the story's really twisty, if not unbelievable at parts, but overall really quality. I think I would have liked the book better if I'd read it before seeing the movie. I think the lack of shock-value brought down my overall feeling towards the book. And if I hadn't already seen the movie, I wouldn't have seen the twists coming. And granted, it's been a few years since I actually saw the movie, so some stuff I didn't remember as much - but I did remember all of the major plot points and major twists. It's almost difficult to review this book, since I've seen the movie and I feel like most people have, but I'm very avid about not posting spoilers, so it's hard to say much without giving anything away. I will say - I enjoyed the book, even though I knew what was going to happen. The writing was solid, the twists were shocking (if I didn't know prior what they were). I was even able to form some of my own perceptions about what the characters looked like without relying too much upon the movie. I want to re-watch the movie at this point just to really compare and contrast now. I definitely agree with you there! I typically read the book first, too, but the movie came out before I was really reading a lot again, so it wasn't even something that had crossed my mind at that point.